St. Paul’s Church finds its main roots in the Methodist Episcopal Church which once flourished at Centre Furnace. First mention of a Methodist congregation at Centre Furnace is found in 1869. The church was then part of the Half Moon Charge. In 1882 there were Methodist Episcopal churches located at Centre Furnace, Boalsburg, Pine Grove Mills, Meek’s (now Fairbrook), Pennsylvania Furnace, Gatesburg, Stormstown, Gray’s, Waddle (now Buffalo Run), Fillmore, Scotia, Pine Hall and Rock. The church at Centre Furnace was a one room wooden structure, seating about 100. It was built on the side of the hill, opposite the old charcoal iron furnace whose stack serves as an historic landmark at the approach to town. Centre Furnace was a thriving community when State College was marked only by the crossing of two country roads. By 1888 the iron-ore smelting business at Centre Furnace had been discontinued and many persons had moved away. Since the Centre Furnace church was in such poor repair, the question of building a new church arose. Some wanted it in Lemont, which was growing and boasted a railroad station. Others voted for locating it in the growing college town. The congregation split and churches were erected in both villages. Today these churches are St. Paul’s United Methodist Church, dedicated in 1888, and Mt. 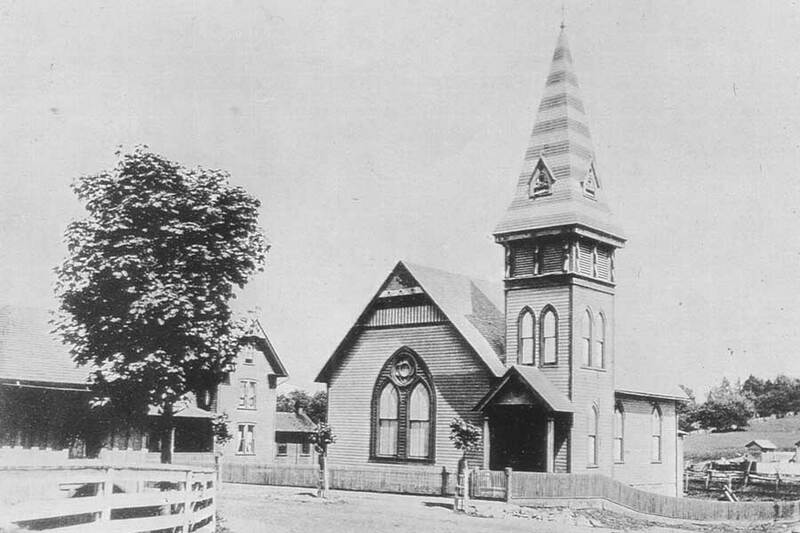 Nittany United Methodist church, dedicated in 1889. A lot, 75 feet x 175 feet, at the corner of Lemont Pike (now College Avenue) and McAllister Street was purchased from John Hamilton. A rectangular building was erected, costing $3,500. The most notable exterior feature was its red and white striped steeple roof, a landmark of that day. A hot air furnace furnished heat and coal oil lamps, suspended by pull chains from the ceiling, furnished the light. A large stone, the one step entrance, remains today at the base of the tower – the only remaining vestige of our first church building. The Sunday School was started immediately, with six organized classes all meeting simultaneously in the church’s one room. Naturally, the teacher talking the loudest had the most listeners. A class for college students and visitors was known as the Drop In Class – its easy accessibility just inside the door may have had something to do with its successful attendance. It was not unusual to begin the lesson with eight pupils and finish with 20! As early as 1904 the congregation was feeling the need to expand. At a meeting of the congregation in 1909 it was decided to build a new church on the site of the old one. The ground breaking ceremony was held in 1910, with the dedication service held in 1912. The cost of the new building was set at $45,000. Among the anecdotes recorded during the construction period was the objection of the borough engineer to building on the lot line on McAllister Street. The objection was overruled when it was pointed out that other public buildings had previously encroached on the lot line. The resident of a house located where the Wesley Foundation now stands had to be convinced by survey that the church was not infringing upon his property. Criticism came both from within and without the congregation for building such a large church and for creating such a great debt. It was common knowledge that the Methodists would never get their church paid for, let alone fill it! Such a fine house of worship needed an equally fine musical voice. Dr. Fred Lewis Pattee was appointed to collect funds for an Estey pipe organ, which was dedicated in memory of Professor Benjamin Gill. The organ, water motor and installation costs totaled $3000. In 1933 a new three-manual Moller organ was purchased at a cost of $6000. Chimes and harp were added to the organ, gifts of A. H. Yocum and B. W. Dedrick respectively, in memory of their wives. There were twenty-six ranks of pipes and more than fifty stops. The chimes had twenty-one bells. The harp had forty-nine bars. The Dobson pipe organ, located in the tower area, was installed in 1990. There are 58 notes on the two manual keyboards and 32 notes on the pedalboard. There are a total of 1543 pipes. The oak case has been decorated with three colors – red which represents fire and earth, blue which represents the heavens, and green which is the color of ordinary time, the time when people labor to attain the Kingdom of God. The gold leaf trim represents the glorious light. The organ weighs about 8,400 pounds. St. Paul’s Church played a vital part in bringing the Boy Scout movement to the community. Sponsored by St. Paul’s, the troop was organized in the spring of 1912 by Professor M. W. Eddy. Always an active and respected troop, the present Troop 31 is the oldest Scout troop in State College, the second oldest continuously-chartered unit in the Juniata Valley Council, B.S.A. In September 1940 the Women’s Society of Christian Service was formed. The organization of the W.S.C.S. throughout the Methodist church automatically bound into one unit the many former women’s organizations – Women’s Home Mission Society, Women’s Foreign Missionary Society, Ladies Aid, Young Women’s Guild, Queen Esther Circle, and Mary A. Beaver Auxiliary. The current organization of United Methodist Women came into being at the time of the Union of the Evangelical United Brethren and Methodist Churches in 1970. Women have found many rewarding opportunities for study and service through their participation in one of the nine circles of St. Paul’s United Methodist Women. Increasingly, more and more young men and women attending college here sought St. Paul’s as a church home away from home. By 1920, more than 700 students gave Methodist as their church preference when registering. The student work of the Wesley Foundation officially began in August 1920. Student classes were formed, an orchestra organized, Friday night socials for students held. The adjacent Dr. Robinson property, facing College Avenue was purchased for a parsonage for the Wesley Foundation pastor. A Foundation building, erected as an addition to St. Paul’s, was dedicated in 1922. The current Wesley Foundation building was dedicated in 1957. A variety of programs have been initiated over the years to meet the needs and desires of the students using the Foundation. As the congregation continued to grow, the Education Building was constructed in 1959 to meet the increasing need for additional space for church school classes. The first full-time Director of Education was hired in 1960. 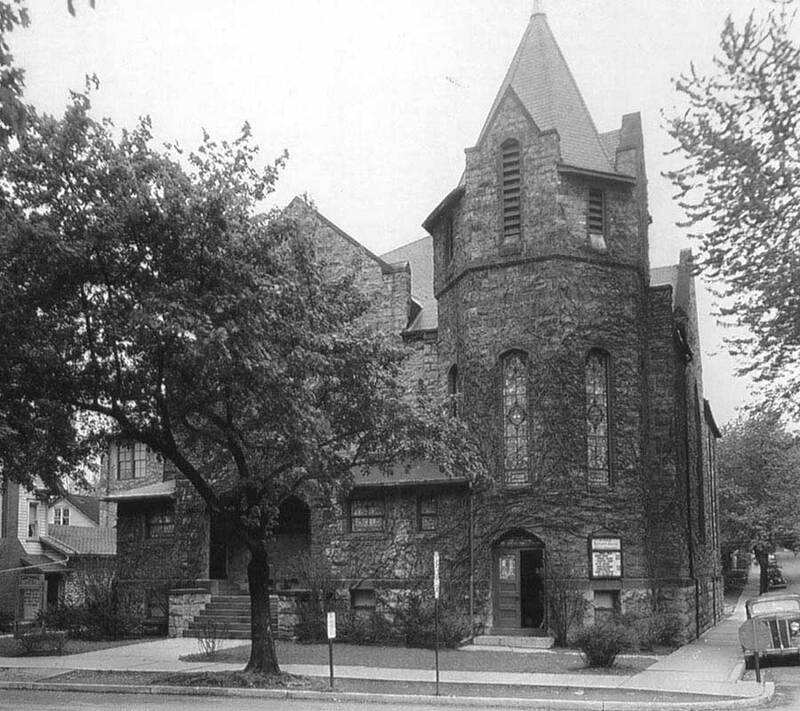 The original parsonage for St. Paul’s pastor was built in 1893 at the corner of McAllister Street and Beaver Avenue. In 1926 a stone house of colonial design was constructed on Beaver Avenue at Garner Street. As the community grew, it became apparent the parsonage location was no longer a residential neighborhood. In 1965 the house at 300 East Irvin Avenue was purchased. The current parsonage on Kay Street in Boalsburg was purchased in 1993. With the appointment of the first Associate Pastor in 1975, the parsonage at 1310 Park Hills Avenue was purchased. A major renovation program was undertaken by the congregation in 1985. The program included major renovations to the sanctuary, the addition of an atrium to the Calder Way facade, an elevator to provide accessability to all levels and a second floor administrative suite at a cost of $600,000. Dedication services were held on December 7, 1986. 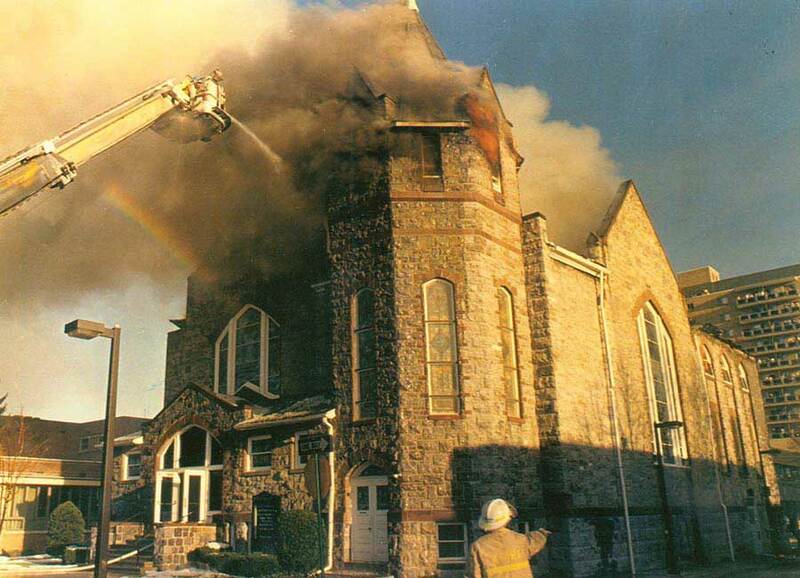 On Friday, November 13, 1987, members and friends of St. Paul’s were distressed to learn of the fire which enveloped and destroyed the sanctuary building. The gymnasium, the new administrative suite, and the Asbury Room survived, but were extensively damaged by smoke and water. On Sunday, two days following the fire, an emotional congregation gathered in Schwab Auditorium on the Penn State campus for a Service of Resurrection. Following the Service, the congregation processed through campus to the site of the fire-gutted church, gathering in Calder Alley for a short prayer service. On January 24, 1988, history once more repeated itself as the congregation of St. Paul’s voted to rebuild – on the same site and within the surviving historic exterior stone walls. During the years of reconstruction which followed, worship services were held in the Wesley Foundation, with the congregation and choir sitting on metal folding chairs. Pedestal fans moved the air in the crowded room through the summers. A few services were held in other locations through the generosity and understanding of the congregation of Grace Lutheran Church and the State College Area School Board. Ground floor classrooms in the Education Building became the temporary site for church offices. On Sunday, February 11, 1990, the congregation gathered to dedicate the new structure, with memories and respect for the past and enthusiasm and optimism for the future. History of St. Paul’s Methodist Church by Vivian Doty Hench, 1952. Our Past, a condensation prepared by Joanne Stamm and Doreen Bailey for Centennial Anniversary Sunday, April 17, 1988.